Plants not only add aesthetic value to an otherwise sterile-looking enclosure, but they also provide a more natural, engaging, and secure environment for the inhabitants to enjoy. Using plants to create visual barriers within the flight may help reduce aggression among cagemates by providing objects for the birds to hide behind.5 This in turn helps to make the birds feel more secure, and may therefore result in reduced stress levels. Foliage in the cage gives the birds something to occupy themselves with--birds often chew on, play within, and even build nests out of plants placed in their living space. For this reason, care must be taken when selecting plants to decorate a flight. Both live and fake plants may be used, but all parts of the plant must be safe and nontoxic. The best fake plants to use are constructed of untreated silk and plastic. Make sure the silk plants do not have any components that may be easy for a bird to consume, tangle itself in, get caught on, or stuck by. Treated wood baskets and paper plants may be hazardous choices and are not recommended for decorating flights. Two benefits of using silk plants are: 1) they are not as easily destroyed by the birds, and 2) they can be scrubbed clean and disinfected as needed. Live plants tend to demand more upkeep and may need to be replaced more frequently, as finches often love to pick them apart. Try to obtain plants that have not been sprayed with any pesticides or chemicals, and be sure to rinse the plants off before placing them in and around the flight. Do not add any fertilizers to the soil (they are toxic);6 if fertilizers are already present in the soil, repot the plant with uncontaminated soil. Leaving each plant in its pot is suggested, in case a plant dies and needs to be removed. Plantings should be spaced appropriately to allow room for flight paths and to permit the birds to access to the floor of the enclosure. Walk-in enclosures should also have planned pathways for birdkeeper access. Be careful to provide climbing vines with trellis to support the weight of their growth; otherwise they could break the aviary mesh and allow escape of the birds. Aside from ensuring that the plant(s) you have selected are non-toxic, try to avoid purchasing plants which are tall and rapidly-growing as these will require constant pruning. In addition to considering what plants are best suited for your area, don't forget to also consider the needs of the birds. 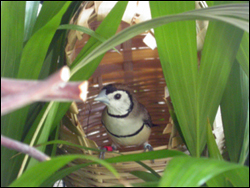 Avadavats and Munias enjoy climbing small bamboos and grasses, for example, Munias and Mannikins prefer to weave their nests into grass clumps, and Weavers need palm leaves and broad-leafed grasses for nesting material. 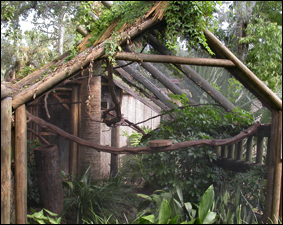 Plants should be added to the enclosure as it is being completed. The plants should be allowed to grow sufficiently before adding the birds; this way, the plants will be better able to withstand being nibbled on. 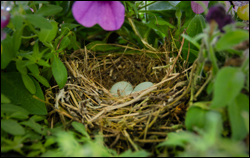 Ideally plants should produce their densest foliage while the birds are nesting. When choosing plants for your aviary, consult a botanist or experienced gardener who can help you select plants which are suitable for planting in your locale (considering your hardiness zone, soil type, sun exposure, etc.). Below are some options which have been listed as safe for birds. Plants which are generally considered safe. Taraxacum officinalis Tagetes spp. Magnolia spp. 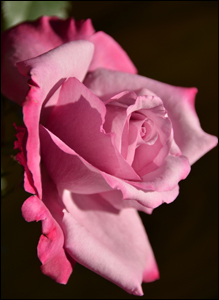 Note: Please be aware that roses and bougainvillea have thorns. Wild passerines built a nest in a hanging petunia. Potted palms provide privacy around the nest. Avocado Persea americana pits, skin, flesh Reduced activity, inability to perch, fluffing feathers, labored breathing, rapid death, generalized tissue congestion. Blue-green algae Schizophycaea sp. some forms toxic Hepatotoxic, lethal respiratory arrest. Calla lily Zantedeschia aethiopica leaves Severe irritation of mucous membranes, edema & irritation may take weeks to subside; severe dyspnea; severe keratoconjunctivitis if plant juices contact eyes. Vomiting, diarrhea. Castor bean or Castor oil plant Ricinus communis beans, leaves Vomiting, diarrhea (possibly bloody), necrosis of organs (liver, spleen, lymph nodes, stomach, intestine) in mammals. Coffee bean Sesbania sp seeds Gastroenteritis, can be fatal. Hyperthermia, hypertension, hyperactivity, seizures, tachycardia. Diffenbachia or Dumb cane Dieffenbachia picta, sp. leaves Severe irritation of mucous membranes, edema & irritation may take weeks to subside; severe dyspnea; severe keratoconjunctivitis if plant juices contact eyes. Vomiting, diarrhea. Elephant's ear Colocasis sp. or Alocasia sp. leaves, stems Severe irritation of mucous membranes, edema & irritation may take weeks to subside; severe dyspnea; severe keratoconjunctivitis if plant juices contact eyes. Vomiting, diarrhea. Ergot Claviceps purpurea present in poorly stored seed, silage, dog food Gangrene, hyperexcitability, seizures. House plant ferns Pteris sp. Jerusalem cherry Solanum pseudocapsicum berries Arrhythmias, bradycardia, heart block, severe gastroenteritis, calcification of vascular system, lungs, kidneys. May be teratogenic. Jimsonweed Datura sp. leaves, seeds Tachycardia, convulsions, death. Lily of the valley Convallaria majalis all parts, including water housing the plant Vomiting, diarrhea, cardiac arrhythmias, bradycardia, heart block. Locoweed Astragalus mollissimus or Astragalus emoryanus all parts Hyperexcitability and locomotor difficulty. Milkweed Asclepias sp. Weakness, ataxia, seizures, cardiovascular signs. Nightshades Solanum sp. berries, leaves Arrhythmias, bradycardia, heart block, severe gastroenteritis, calcification of vascular system, lungs, kidneys. May be teratogenic. Oak Quercus sp. Anorexia, diarrhea, small intestinal ulceration and hemorrhage, renal failure & polydypsia, hepatotoxic, can be fatal. Philodendron Philodendron sp. leaves, stems Severe irritation of mucous membranes, edema & irritation may take weeks to subside; severe dyspnea; severe keratoconjunctivitis if plant juices contact eyes. Vomiting, diarrhea. Poinsettia Euphorbia pulcherrima leaves, flowers, stem, oily white sap Irritation, vesication, gastroenteritis, conjunctivitis. Pokeweed Phytolacca americans leaves, roots, berries Ulcerative gastroenteritis; acute hemolytic crisis in people. Potato Solanum tuberosum skin, eyes, new shoots Arrhythmias, bradycardia, heart block, severe gastroenteritis, calcification of vascular system, lungs, kidneys. May be teratogenic. Pothos Epipremnum aureum all parts Regurgitation, oral pain, dysphagia and anorexia. Rosary pea, prayer beans, Seminole beads Abrus precatorius seeds Vomiting, diarrhea (possibly bloody), necrosis of organs (liver, spleen, lymph nodes, stomach, intestine) in mammals. Sago Palm, Zamia Palm, Cycad Palm Cycad sp. Liver failure. Tobacco Nicotinia sp. leaves Vomiting, diarrhea, hyperexcitability, muscle fasciculations, seizures, rapid death. Pododermatitis if bird handled by a smoker. Coughing, sneezing, sinusitis, conjunctivitis, secondary respiratory infections if exposed to cigarette smoke. Yew Taxus media wood, bark, leaves, seeds Vomiting, diarrhea, weakness, shock, coma, seizure, deaths from cardiac or respiratory failure. Studies of plant toxicity in finch species are greatly lacking, however a few studies were done using canaries. Unfortunately, because great variation exists among species, it is not safe to assume that plants which are non-toxic to canaries are equally safe to other birds and vice versa. AUTHOR(S): Arai, M.; Stauber, E.; Shropshire, C. M.
TITLE: Evaluation of selected plants for their toxic effects on canaries. ABSTRACT: Leaves or fruit from 14 plants considered to be toxic to pet birds were administered by gavage to 15 pairs of canaries (Serinus canaria). Each bird was given 0.12 to 0.70 g of plant material. One pair served as a control and was given distilled water. The plant materials were flash-frozen in liquid nitrogen, pulverized, and resuspended in deionized water for administration. Of the plants tested, 5 (oleander, lupine, foxglove, yew leaves, and dieffenbachia) were considered highly toxic and were associated with acute death of birds. The remaining plant samples (clematis, Hoya carnosa, privet Ligustrum vulgare, parsley Petrosilium sativum, cherry Prunus sp., Pyracantha coccinia, rhododendron, black locust Robinia pseudoacacia, and wisteria) caused no, or only transient, clinical illness. AUTHOR(S): Hargis, A. M.; Stauber, E.; Casteel, S.; Eitner, D.
TITLE: Avocado (Persea americana) intoxication in caged birds. ABSTRACT: Following two incidents in which a pet canary and three pet cockatiels died under conditions suggesting ingestion of avocado as cause of death, an experimental study was undertaken. Avocados of two cultivars were mashed and administered via feeding cannula to 8 canaries and 8 budgerigars. Two control budgerigars were given water via feeding cannula. Six budgerigars and 1 canary died within 24 to 47 hours after the first administration of avocado. Deaths were associated with administration of both avocado cultivars. Higher dose was associated with greater mortality. The 2 budgerigars given water were normal throughout the observation period. It is concluded that avocados are highly toxic to budgerigars and less toxic to canaries. PM findings observed in some birds included subcutaneous oedema in the pectoral area and hydropericardium. AUTHOR(S): Shropshire, C. M.; Stauber, E.; Arai, A. TITLE: Evaluation of selected plants for acute toxicosis in budgerigars. ABSTRACT: Pairs of budgerigars were given samples, by gavage, of plants considered potentially toxic to pet birds. Samples were prepared by flash-freezing and powdering fresh plant material in liquid nitrogen and resuspending the material in deionized water for administration. Of the 19 plants tested, only 6 induced clinical signs of illness; these plants included yew, oleander, clematis, avocado, black locust, and Virginia creeper (Taxus media, Nerium oleander, Clematis sp, Persea americana, Robinia pseudoacacia, Parthenocissus quinquefolio). The other plants tested in this study were: bleeding heart (Lamprocapnos spectabilis), privet (Ligustrum sp. ), honeysuckle (Lonicera sp. ), lupine (Lupinus sp. ), cherry (Prunus sp. ), pyracantha (Pyracantha coccinea), boxwood (Buxus sp. ), dumbcane (Dieffenbachia seguine), foxglove (Digitalis sp. ), spindle bush (Euonymus alatus), poinsettia (Euphorbia pulcherima), rhododendron (Rhododendron sp. ), and blue elderberry (Sambucus cerulea). Note how some plants which appear well tolerated by budgies (lupine, dieffenbachia, foxglove) prove fatal to canaries, while some plants which canaries appear to tolerate (clematis, black locust) make budgies quite ill. Until more research is done, it is important to err on the side of caution and avoid any plant which may potentially be toxic.